Sustainability principles are built into the research and development process at the Napapijri® brand, and are at the heart of the company’s “Make it Better” commitment to the environment and animal welfare. Through two cutting-edge innovations: Thermo-Fibre™ and Kanecaron®, the Superlight Skidoo is now fur and goose-down free. The parka, which is 1 kilogram (2 pounds) lighter than the brand's average winter parka is a testament to how sustainability can be a lens for innovation. Back in 2012, the Napapijri® brand began its journey to become fur-free. A key turning point took place in 2015, when the brand phased out real fur thanks to the development of the innovative Eco-Fur Kanecaron® fibers. Implementing lessons learned from the fur-free approach and remaining strongly committed to “Make it Better,” the Napapijri® brand developed a down free insulation replacement called Thermo-Fibre™. Today, the brand's entire collection is 100 percent down free. These concepts find maximum expression in the Superlight Skidoo. 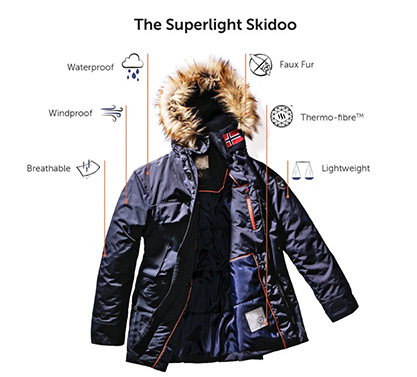 The jacket was re-engineered to weigh drastically less than previous versions and perform better across a range of temperatures using the new Thermo-FibreTM technology.